Ce3 is a Contract Research Organization (CRO) specializing in early phase clinical development services for the biotechnology industry. Ce3’s extensive experience in clinical trial management has led to success in many challenging therapeutic areas, including oncology and infectious disease as well as gene and cell therapy in oncologic and other indications. Since 2011, we have performed numerous projects and provided SharePoint support. They had a system that was on the way to becoming mission-critical and was beset by issues with versions, custom developed software and an unclear path to their strategic goals with SharePoint technology. From version 2007 to 2010 to 2013 to 2016 - we have provided managed SharePoint services and project support, with technical guidance, and business analyst skills to translate strategic plans into actionable process automation solutions. We have built numerous extranet portals, restructured them, designed taxonomy and managed metadata systems to drive complex workflows. Advance security and advanced customized branding have been some of the services we have provided. Throughout our business relationship, we've had deep collaboration to address challenging project management requirements for compliance with 21 CFR Part 11. SharePoint technologies are integral to CE3 in terms of business strategy, and services management. 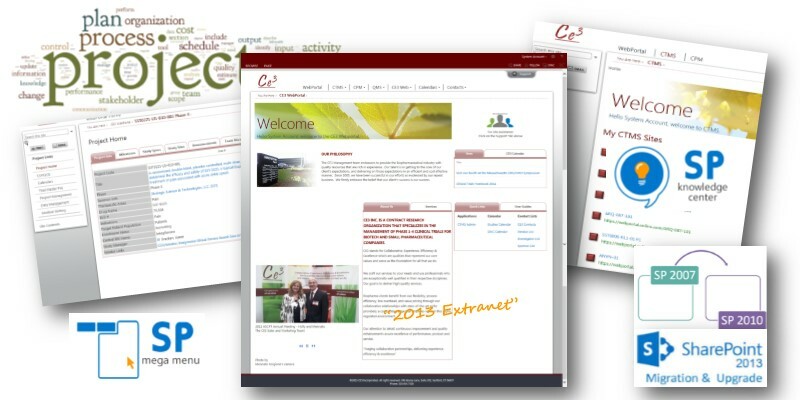 We've had the privilege of being a partner with CE3 to assist their vision and strategic goals fulfillment with SharePoint technology. As a direct result of the strategic use of SharePoint their business has profited and grown. When you're doing a SharePoint migration you want to be sure that you're using the best Microsoft SharePoint consulting services so that there are no surprises. Please read more about our zero business outage SharePoint migrations here and contact us today!